Players of the Gears of War 3 beta have the opportunity to unlock exclusive weapon variants in the full game. 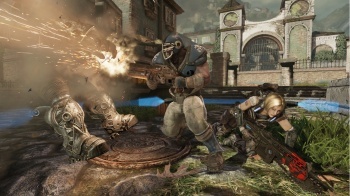 As if getting to play Gears of War 3 early by taking part in its multiplayer beta wasn't enough, Epic Games is also awarding players that complete certain conditions with beta-exclusive weapon variants. Epic recently announced that the beta will begin on April 18 and end on May 15. However, only purchasers of Epic and People Can Fly's Bulletstorm: Epic Edition for the Xbox 360 will be able to play up until April 25. On that date, the Gears of War 3 beta will be open to everyone that pre-orders the game through select retailers. Epic will start the beta with a single multiplayer mode, Team Deathmatch, and later add Capture the Leader and King of the Hill. These modes will be playable on four new maps: Thrashball, Checkout, Trenches, and Old Town. The studio is also teasing a "surprise event weekend" it says "you won't want to miss." The weapon variants of previous Gears of War games were highly sought after, so this is definitely a great way for Epic to get players to help test Gears of War 3 and to drum up early pre-orders. Gears of War 3 will be available for the Xbox 360 in fall 2011.